As per the title of this blog post, the feature vegetable in this summer salad is none other than the broccoli. Growing up we typically only enjoyed broccoli when it was cooked into saag which is a giant mush (I'm not joking) of cooked down onion, spinach, broccoli and an array of spices. Now, I have fun using broccoli in stir fry's, roasted, dunked into a ranch dip and of course, all dressed up in a Greek yogurt dressing. I'm sure you've tried a few versions of this recipe. But I really think you should make my recipe your go-to for summer potlucks, dinners or even enjoy this salad as a snack. Along with broccoli, this salad also includes a juicy apple, red onion, carrot sticks, cranberry and pumpkin seeds. Feel free to swap out ingredients and change the quantities as you wish. The "OG" version of recipe usually calls for copious amounts of mayo and sometime bacon. THIS version is laced with a high protein dressing courtesy of Greek yogurt. 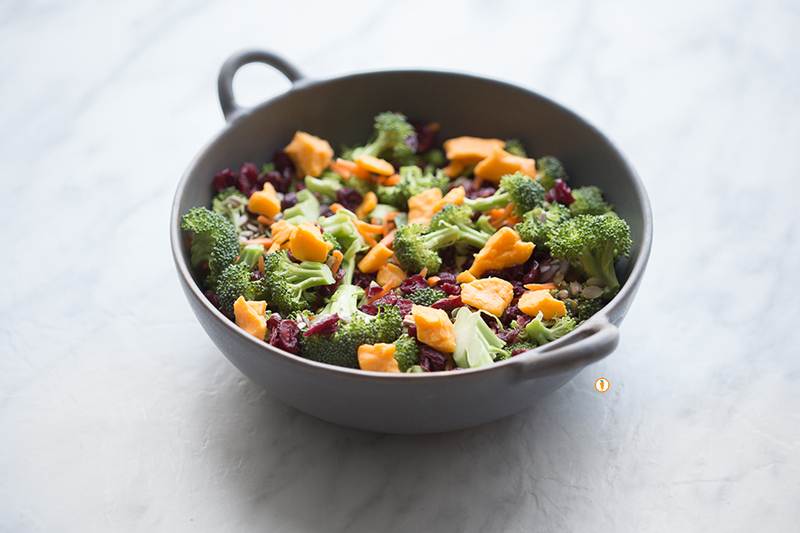 Place all prepared veggies, apple, cranberries, pumpkin seeds and cheese into a bowl. Toss together. To prepare the dressing stir together Greek yogurt, mayonnaise, honey, lemon, salt, pepper and paprika. Pour the dressing (only half at a time) over the salad, ensuring the veggies are well coated. Let the salad sit in the fridge for 20 minutes to soften the broccoli. Add more dressing if desired.